Take a minute and think about your home. When you first bought your home, what features drew you to it? Was it the four bedrooms, three baths and a large master suite? Or was it the gourmet kitchen that could feed 20 of your closest friends? For the average home-buyer the amount of space is key when purchasing a home. But, a big property comes with a big price. If you cannot afford to continue living in your large home, a way to remedy that is to downsize your property. That said, downsizing isn’t just for retirees and empty nesters. It’s a great way to lessen debt and gain financial freedom no matter how young or old you are. There are a lot of financial benefits to doing more with less. If you are thinking about downsizing, here some of the financial benefits of downsizing your home. By buying a smaller house or property, you instantly save money by having a lower house payment every month. Not to mention lower total debt. The difference you save in a house payment can be directly applied to current debt or invested in the stock market. Either way you are making gains toward achieving financial freedom. Downsizing your home means downsizing your stuff. You can’t fit the same amount of stuff into a smaller space comfortably. (If you do try to cram it all in, that’s called hoarding and is a topic for another blog. Just kidding, but seriously.) This means you should take the time to declutter and get rid of unused or unwanted belongings. The best part about decluttering is that you can sometimes make money back from selling your clutter. A smaller space does not take as much energy to warm it up in the winter or cool it down in the summer, thus you’ll enjoy lower utility bills by downsizing your home. By not running the heat or air conditioner as much, you save on your electric bill as well. A smaller space also requires fewer lights, so you won’t need to turn as many on at one time, which also saves energy. 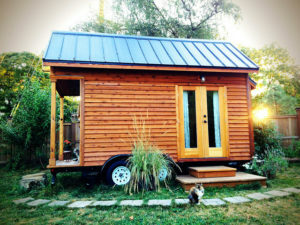 Lower utility bills is a definitely a financial positive for downsizing. A smaller property is not taxed as much as a larger property, so you’ll pay less for property taxes if your downsize your home. Enough said. When you downsize, you might make enough off of the sale of your larger home to completely pay for the smaller home in cash, which means you’ll have no mortgage debt hanging over your head each month. Even if you don’t make enough cover the entire purchase of your new, smaller home, you can at least make enough to not have to pay for a cash down payment on the smaller property. Maintenance costs are of the things I hate most about being a homeowner, and they are also one thing many people forget to account for when buying a house. A smaller home means less work to keep it up, especially if you end up purchasing a condo or apartment. Instead of replacing ten windows in a larger home you might only have to do three if you have a smaller place. Savings in landscaping, lawn maintenance and on your summer water bill also provide an instant bonus to your savings. Last, but not least, when you downsize and move into a smaller home, it’s possible for you to move to a place with a lower cost of living. If it costs less to live in a certain neighborhood, you’ll see instant savings over your old neighborhood or city. It may not be a possibility to move to a different area due to factors such as your job and your family’s needs, but it’s definitely worth considering when downsizing your home. As with anything, there are always other factors to think about when you are considering downsizing your home. In the end it comes down to what fulfills your needs and fits your budget best. Have you ever thought about downsizing your home? What else did you consider before you downsized? We downsized two years ago and couldn’t be happier. We were able to take the equity from our large home and use it to pay cash for the (current) smaller one! And we moved into a townhouse so no more yard work, exterior maintenance, etc. Besides the cost savings, there are the other benefits (some mentioned) like faster and easier to clean, and with a townhouse the ability to “just close it up and go”. If you like to travel this “close and go” option is really nice! We love the downsized lifestyle. I’m glad you like the post Brad. I’m also happy to hear that you are enjoying the smaller home you bought. That’s awesome!